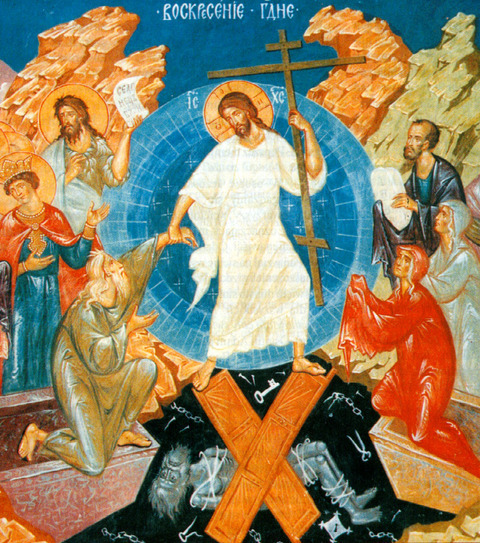 A week passed since we Christian celebrated Resurrection of Christ (Pascha). 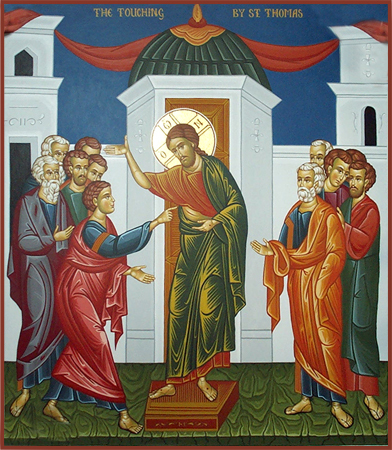 Each year on first Sunday after Easter in orthodox Church is celebrated the so called Thomas Sunday. So why is it called Thomas Sunday and why it is the day of disbelievers? The root of this ancient Christian feast comes after commemoration of Christ desciple St. Thomas who disbelieved the testimony of ( 10 apostles ) and the Virgin Mary that Jesus Christ is Risen from the Death. The disbelieve of Thomas was logical and human cause even though Thomas was with the Apostles with Christ for 3 years, saw all Jesus miracles and shared the Secret Supper (Last Supper), and even knew in advance (heard by Jesus on Last supper) that Jesus will betrayed mocked, hanged on the Cross and Rise from the death on the third day, he disbelieved. Thomas Sunday (Sundy of Thomas) is "the day of Disbelievers", because all are disbelievers in moments of their life not only those who believe God but all the humanity! Even the most faithful Christian, be it a deacon, monk or priest has difficult moments in life where God's existence or providence for one's faith is seriously questioned. The fallen nature of man is such that the initial belief in God given to man in Eden (Paradise garden) is broken, and only in Jesus's name through the Gift of Faith given by the Holy Spirit, believe in God is restored. Thomas very much like unto everyone of us doubted the rumors of Christ resurrection and said he would only believe in Resurrected Christ only if he sees his hands nails print and put his fingers into Christ’s wounds to test he is not seeing a Ghost but Christ is alive in a body after his death. Jesus did many other miraculous signs in the presence of his disciples, which are not recorded in this book. We Christians should be joyful for have not seen Christ in Flesh but have believed for we are blessed for his believe without seeing. By same faith in God without seeing him even in old times the Jews were led by the Lord God in the desert have won wars by their believing without seeing God, prophets has prophecised, Simeon (The God receiver) hold The Savior (Christ) in his hands, by faith David won the battle with Goliath, by faith we understand the universe was formed at God’s command, by faith we know that the visible came out of the invisible. o Kyrios mou kai o Theos mou (Greek) – My Lord and my God (Jn. 20:28) this declaration of faith clearly shows an unexpressable excitement of Thomas and his unexpectency to see Christ resurrected. Here it is interesting that here the son of God Jesus Christ is called by Thomas exactly how Jewish used to call God Yahweh (One and Only God) in the Old testament. Today the evangical story is very accurate for our generation – a generation of disbelievers, even we who say we believe often doesn’t justify our believe with our deeds, we say we believe but we don’t keep God’s commandment “to love God and our neigbor like ourselves.” Often only difference between believers and disbelievers is on Sunday we believers visit Church and “play Christians”, but even but in daily life our deeds are same like unbelievers. Often many are disbelievers not because they reject God but because they never heard the Gospel or misheard it, also we disbelieve because we’re very much like st. Thomas, we often say “I will believe in God if I see him”, but even Thomas who saw God before the Crucifix and knew him disbelieved – a proof that often seing once could still leave space for doubt. 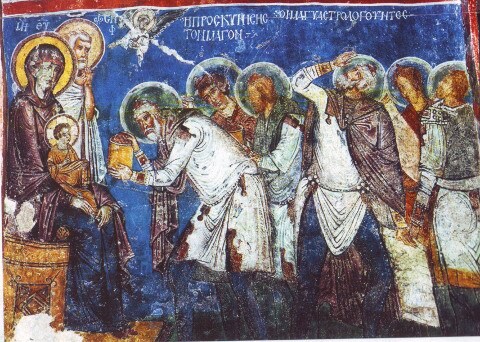 The glorious event of Christ showing himself Alive to Thomas was made by Christ to establish the Church and strengthen faith of first Christians in resurrection. Nowadays there are plenty of people who question God’s existence saying that they will believe if they see but they’re not given to see the resurrected Christ because God knows that even if we see the Lord Jesus Christ resurrected we would try to rationally explain the phenomenon with holograms, modern technology or science. Thomas Sunday is not only a day of Thomas disbelieve it is a day of disbelieve of all humanity. , St. Thomas should be an example even to all of us Christian disbelievers and non-believers that even if we disbelieve and doubt and strive to see God, He is powerful to come and appear Resurrected in His Glory to our souls. I'm eager to find as much as possible, about the Orthodox Church worldwide. So I took the time to collect the Church Hymns (Troparions and Kondaktions) which are sung in each of patriarchate Churches celebrating on 6th against 7th. Hopefully my little article will help other Orthodox Christians who want to know more how other nation-wide "sister" Orthodox Churches are celebrating Nativity's feast, as well as hear the identical Orthodox Church hymn performed in other languages. This two Churches areclose to Eastern Orthodox Church in teaching, but are not in official eucharistic communion. Probably there are also other Christian Churches celebrating on 6-th against 7-th of January and maybe I'm missing some Orthodox Church. 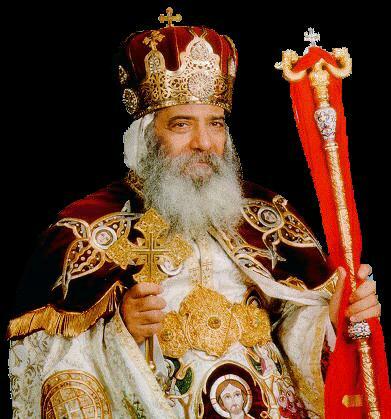 I personally know a person from the Coptic Orthodox Church of Alexandria. Lets hope by the prayers of the Holy Theotokos Virgin Mary and all saints, soon the Oriental Orthodox Churches will come back and recognize decisions taken by Holy Fathers on 7 Orthodox Church ecumenical councils and then we all joyful sing together united in the faith of the Holy Apostles our Lord Jesus Christ's Nativity hymn ! If you happen to be reading my post and you belong to another Orthodox Church patriarchate I forgot to mention or don't know about, please drop a comment to which Church you belong and put a link to your Church sung Troparion and Kontakion. Let us together rejoice with the joy of Angels and the wise East Magis who came to venerate the birth of King of Kings with gifts and gold. Troparion (Tone 4) Your Nativity, O Christ our God, Has shone to the world the Light of wisdom! For by it, those who worshipped the stars, Were taught by a Star to adore You, The Sun of Righteousness, And to know You, the Orient from on High. O Lord, glory to You! 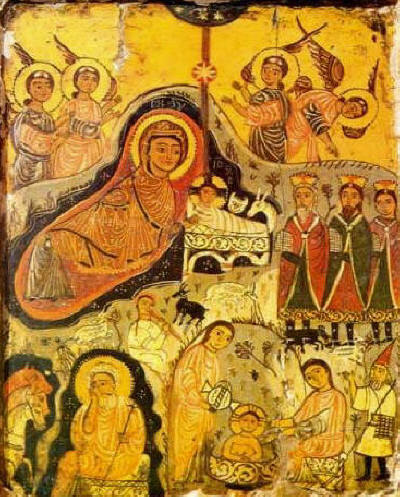 Kontakion (Tone 3) Today the Virgin gives birth to the Transcendent One, And the earth offers a cave to the Unapproachable One! Angels with shepherds glorify Him! The wise men journey with a star! Since for our sake the Eternal God was born as a Little Child! 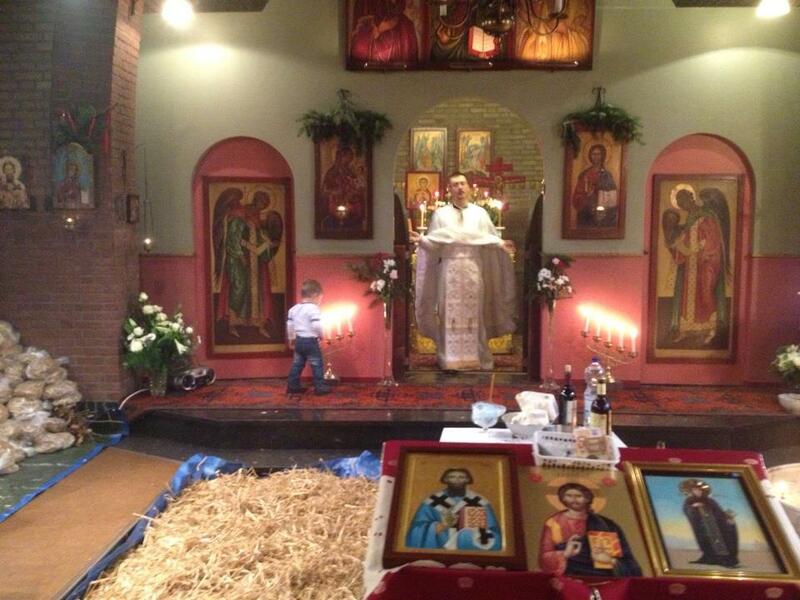 I'm in Holland and here the closest place to Arnhem where Orthodox Holy Liturgy is served is in Nijmegen. I go every Sunday on Church taking the train from Arnhem to Nijmegen – the whole trip takes 15 to 20 minutes .One Sunday, I go to Russian Orthodox Church, and one Sunday to Serbian Orthodox Church. As a rule of thumb for us Orthodox, if we attend Orthodox Church different from your nation wide (autocephalous) Orthodox Church, the person who takes part in prayer and Eucharist communion with the respective Church should celebrate the Church feasts according to the respective Orthodox Church calendar (in my case Russian and Serbian Orthodox Church) calendar. Both Russian and Serbian Church are following the so called Old Church Calendar, where in my national Church the Bulgarian Orthodox Church just like Greeks, we follow the "New feasts Church Calendar". The difference between the two calendars is 13 days in some of the feasts, meaning Orthodox Churches which still observe the Old Church Calendar have some of the feasts like Nativity 13 days later. Two years ago, I've celebrated Christmas with the Russian Orthodox Church on the 3rd day of Nativity (9th of January). This year by God's great mercy I had the chance to celebrate Ð Ð¾Ð¶Ð´ÐµÑÑ‚Ð²Ð¾ Ð¥Ñ€Ð¸ÑÑ‚Ð¾Ð²Ð¾ with the Serbs. Thus this, year I celebrate Nativity (Ð Ð¾Ð¶Ð´ÐµÑÑ‚Ð²Ð¾ Ð¥Ñ€Ð¸ÑÑ‚Ð¾Ð²Ð¾ – as we say in Bulgarian following the Old Church Calendar today on 6-th against 7-th January Eve. In Nijmegen, there will be no midnight (Ð¿Ð¾Ð»ÑƒÐ½Ð¾Ñ‰Ð½Ð¸Ñ†Ð°) Holy Liturgy, but instead on Sunday Morning, there was a Holy Liturgy in which we celebrated the feast of Nativity of the Lord Lord Jesus Christ and at the end of Church service we greeted each other with the joyful salute Christ is born – Truly he is Born! It was a joyful service leaded by the hieromonk priest father Dushan, who is in charge of Nijmegen's, Amsterdam and Breda Westen Europe Serbian eparchy . Serbs are very good people and everytime I go to Serbian Church, I'm warmly accepted as true brother in Christ, this time it was no different. It was a triple feast for me as I both celebrated the birth of our Lord and savior Jesus Christ, received the Holy Sacraments and venerated the Holy relics of this Great Saints. In Serbian Church have, the same pious tradition like in our Bulgarian Orthodox to great each other with the Nativity (Rojdenski) Church Greeting – Ð¥Ñ€Ð¸ÑÑ‚Ð¾Ñ ÑÐµ Ð Ð¾Ð´Ð¸ – Ð’Ð¾Ð¸ÑÑ‚Ð¸Ð½Ñƒ ÑÐµ Ð Ð¾Ð´Ð¸ / Christ is born – Truly he is Born! In Serbian Christmas is called Bozec / Badni Dan (Yule-log tree day), very similar to the Bulgarian Ð‘ÑŠÐ´Ð½Ð° Ð’ÐµÑ‡ÐµÑ€ / Badna Vecher (Yule-log tree night). In Serbia Christmas is known as Bozic, often written in latin as Serbs tend to write nowadays mainly in Latin, Cyrillic however is still in wide use mainly in Serbian Church. Mentioning cyrillic I should say, Serbian is in maybe 60 / 70% similar or same in words as Bulgarian language as we are brother nations, and plus the Holy Liturgy service is in Church Slavonic so I understood about 80 to 90% of all the service with no problem. Also speaking with Serbians is very easy, if I speak a simplified version of Bulgarian and they speak simple Serbian – our languages are almost identical. A Situation with Serbian and Bulgarian is very much like here Holland with German language. There were few things in the Church, which was new for me. 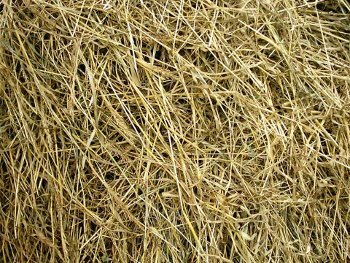 A native Serbian Church tradition is they bring haystacks in the Church as a remembrance for Christ being born among the hay in the manger. 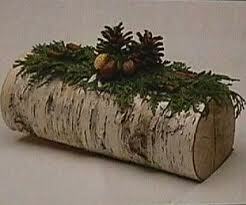 Also one other local tradition which is not in the Bulgarian Orthodox Church and not in Russian Orthodox Church is bringing the yule-log tree trunk in the Church. In Bulgaria we also put Christmas, new year tree but not the cut trunk of it. It was very joyful, the whole Church was full of people from ex-Yugoslavia – Serbia, Bosnia & Hertzegovina and Macedonia. The biggest joy was the plenty of children and new-borns from age around 1 year to age 7 – 10 years. There were also plenty of teenagers and people in their 20 – 30s, something I've rarely seen in Bulgaria. The fact that the Church service was all attended by Emigrants and the fact serbians help each other so much while living abroad is something that makes me rejoice, the only thing I don't understand and (pray it change) is why we Bulgarians are united like this? At the end of the Church service, there was something I liked very much too. The little kids in the Church were invited to come to the piles of hay on the ground sitting behind the icons, and told there are candies hidden in the hay 🙂 The kids started seeking through the straws finding chocolates in different forms joying. The idea of this entertainment "game" was great, as it makes children feel at home in the Church and by doing so Serbs teach their children to love the Holy Church and by this are little by little raising the next generation of devoted Serbian Orthodox Christians. I never saw in Bulgarian Orthodox Church, any activity in our Church like this, so I think maybe if our Church organizes something like this on Christmas it will be very good for both Bulgarian Orthodox parents and kids. To make the Church joy complete, at the end of the Church service, all the layman were invited for a cup of coffee, tea and quick fasting meal. 6-th against 7-th of January is the last day of the Nativity fasting in the Church and since the fasting is over early on 7-th morning after the night vigil and morning holy liturgy all food in the little kitchen of the Byzantine Building ( Chapel ) was fasting. People from Church has prepared a very taste food, many of which in type was very similar to the food we eat in Bulgaria during fasting and Nativity. Just like us Bulgarians, Serbs also have Rakia as a traditional alcoholic beverage. This time they had a Serbian tea (as they call it) a mixture of hot tea and good quality rakia 🙂 – I rarely drink alcohol these days but this "Serbian tea" I liked very much. Among the food, there was the traditional wrapped rice in cabbage leaves, peppers filled with rise, own baked loaf (pitka), some very delicious meal combining something like boiled potatoes with mushrooms and some vegetables inside looking a bit like the Bulgarian Banica. It is like a Church tradition, here in the West Orthodox Churches, to eat together after the end of Holy Liturgy. In the Holy Trinity Church in Dobrich, sometimes we do this as well but not every time like here in West. Eating together with the brothers and sisters from the Church makes the Church experience complete and is a symbolic continuation of communion after the true communion receiving the Holy Blood and Holy Flesh of the Lord Jesus Christ – the Eucharist. In Serbian and Russia and Jerusalem as well as Orthodox Church January 6th against 7th eve is Nativity (The day in which we Orthodox Christians, celebrate The Incarnation (Birth) of Christ). In the Orthodox Church, there are some Orthodox Churches who celebrate Nativity on 24th against 25-th December (Bulgaria, Greece, Romania etc.) and some who celebrate Nativity on 6-th against 7-th January (Russia, Jerusalem, Syria, Serbia, Ethiopia, Egypt etc.) . The reason for this is some autocephalous (nation wide) Orthodox Churches use the so called New dates Church calendar, and others are still using the Old Calendar. Nomatter that all Orthodox Churches are in eucharistic (sacramental) communion and celebrate Easter on one and same date. The feast of birth of Christ was known to be originally celebrated on 24-th against 25-th of December (but this was according to the previous dates calendar used in the world which was based on the moon phases). After whole the world accepted and use even till now the so called Gregorian Church calendar, which is said to be more mathematically precise some of the national Orthodox Churches, with the usual consent between all nation Orthodox Church Patriarchates decided to move the 24-th against 25-th December to be celebrated on 24 to 25-th eve to be more accurate with the world dates calendar used by all throughout the world. This same 24-th against 25-th of December according to the old world dates calendar which was used in most Christian countries before the Gregorian calendar become the de-facto standard for world calendar coincides with 6-th against 7-th December. There was quite a talk going around between people who were for and against the 24-th and 25-th calendar, as in all Orthodox Churches until the 1950/60 Nativity of Christ was celebrated on 6-th against 7-th January. Now there are two camps of people in the one Holy Apostolic Orthodox Church, those for the new calendar and those against it. Actually in practice following Christmas on both date is not incorrect, and it should be mentioned in very ancient times of the Church, Nativity of Christ was celebrated every-day as Church services were continuing 10 to 12 hours each day!!!! Thus in ancient Church, there was not a special day for a birthday of Christ, but it was known in the Church Christ for sure Christ was born in December, many saints (if not mistaken) including st. John of Chrysostom said 24-th eve is the correct date on which the most pure Mother of God Virgin Mary gave birth to our savior and Messiah (Christ). No-matter about the date, even as situation now is where some Churches celebrate Christmas on 24th eve and some on 6th against 7th this should not be perceived as separation of the Church, but as point of unification and increasing of possibility of people to hear about the birth of the savior of us the sinful humanity. As the good news of Nativity is preached and heard by unbelievers and believers twice the year instead of just one, making the world remember twice about the moment in which we received the news for hope of redemption and salvation from the corruption of death that ruled over us before Christ's incarnation and salvation mission on earth. Ð¢Ð²Ð¾ÐµÑ‚Ð¾ Ñ€Ð¾Ð¶Ð´ÐµÑÑ‚Ð²Ð¾, Ð¥Ñ€Ð¸ÑÑ‚Ðµ Ð‘Ð¾Ð¶Ðµ Ð½Ð°Ñˆ, Ð¾Ð·Ð°Ñ€Ð¸ ÑÐ²ÐµÑ‚Ð° ÑÑŠÑ ÑÐ²ÐµÑ‚Ð»Ð¸Ð½Ð°Ñ‚Ð° Ð½Ð° Ð¿Ð¾Ð·Ð½Ð°Ð½Ð¸ÐµÑ‚Ð¾. Ð—Ð°Ñ‰Ð¾Ñ‚Ð¾ Ð² Ð½ÐµÐ³Ð¾ Ð¾Ð½ÐµÐ·Ð¸, ÐºÐ¾Ð¸Ñ‚Ð¾ ÑÐ»ÑƒÐ¶ÐµÑ…Ð° Ð½Ð° Ð·Ð²ÐµÐ·Ð´Ð¸Ñ‚Ðµ, Ð¾Ñ‚ Ð·Ð²ÐµÐ·Ð´Ð°Ñ‚Ð° ÑÐµ Ð½Ð°ÑƒÑ‡Ð¸Ñ…Ð° Ð´Ð° ÑÐµ Ð¿Ð¾ÐºÐ»Ð°Ð½ÑÑ‚ Ð½Ð° Ð¢ÐµÐ±Ðµ, Ð¡Ð»ÑŠÐ½Ñ†ÐµÑ‚Ð¾ Ð½Ð° Ð¿Ñ€Ð°Ð²Ð´Ð°Ñ‚Ð°, Ð¸ Ð´Ð° Ð¿Ð¾Ð·Ð½Ð°Ð²Ð°Ñ‚ Ð¢ÐµÐ±Ðµ, Ð˜Ð·Ñ‚Ð¾ÐºÐ° Ð¾Ñ‚ Ð²Ð¸ÑÐ¸Ð½Ð¸Ñ‚Ðµ. Ð“Ð¾ÑÐ¿Ð¾Ð´Ð¸, ÑÐ»Ð°Ð²Ð° Ð½Ð° Ð¢ÐµÐ±Ðµ! Ð Ð¾Ð¶Ð´ÐµÑÑ‚Ð²Ð¾ Ð¢Ð²Ð¾è, Ð¥Ñ€Ð¸ÑÑ‚è Ð‘Ð¾Ð¶Ðµ Ð½Ð°Ñˆ, Ð²Ð¾Ð·ÑÐ¸Ñ Ð¼ùÑ€Ð¾Ð²Ð¸ ÑÐ²ÐµÑ‚ Ñ€àÐ·ÑƒÐ¼Ð°: Ð² Ð½ÐµÐ¼ Ð±Ð¾ Ð·Ð²ÐµÐ·Ð´Ð°Ð¼ ÑÐ»ÑƒÐ¶àÑ‰Ð¸Ð¸ Ð·Ð²ÐµÐ·Ð´òÑŽ ÑƒÑ‡Ð°Ñ…ÑƒÑÑ Ð¢ÐµÐ±è ÐºÐ»àÐ½ÑÑ‚Ð¸ÑÑ Ð¡Ð¾Ð»Ð½Ñ†Ñƒ Ð¿Ñ€Ð°Ð²Ð´Ð¸, Ð¸ Ð¢ÐµÐ±è Ð²èÐ´ÐµÑ‚Ð¸ Ñ Ð²Ð¸ÑÐ¾Ñ‚ù Ð’Ð¾ÑÑ‚òÐºÐ°: Ð“Ð¾ÑÐ¿Ð¾Ð´Ð¸, ÑÐ»Ð°Ð²Ð° Ð¢ÐµÐ±è. Ð¿Ð¾Ð½ÐµÐ¶Ðµ Ð·Ð°Ñ€Ð°Ð´Ð¸ Ð½Ð°Ñ ÑÐµ Ñ€Ð¾Ð´Ð¸ ÐœÐ»Ð°Ð´ÐµÐ½ÐµÑ† – ÐŸÑ€ÐµÐ´Ð²ÐµÑ‡Ð½Ð¸ÑÑ‚ Ð‘Ð¾Ð³. Ð’Ð¸Ñ‚Ð»ÐµÐµÐ¼ Ð¾Ñ‚Ð²Ð¾Ñ€Ð¸ Ñ€Ð°Ñ, ÐµÐ»Ð°Ñ‚Ðµ Ð´Ð° Ð²Ð¸Ð´Ð¸Ð¼, Ð½Ð°Ð¼ÐµÑ€Ð¸Ñ…Ð¼Ðµ Ñ…Ñ€Ð°Ð½Ð° Ð½Ð° Ñ‚Ð°Ð¹Ð½Ð¾ Ð¼ÑÑÑ‚Ð¾: ÐµÐ»Ð°Ñ‚Ðµ Ð´Ð° Ð²Ð·ÐµÐ¼ÐµÐ¼ Ð¸ÑÑ‚Ð¸Ð½ÑÐºÐ° Ñ€Ð°Ð¹ÑÐºÐ° Ñ…Ñ€Ð°Ð½Ð° Ð² Ð¿ÐµÑ‰ÐµÑ€Ð°Ñ‚Ð°. Ð¢Ð°Ð¼ ÑÐµ ÑÐ²Ð¸ ÐºÐ¾Ñ€ÐµÐ½ Ð½ÐµÐ½Ð°Ð¿Ð¾ÐµÐ½, ÐºÐ¾Ð¹Ñ‚Ð¾ Ð¿Ð¾ÐºÐ°Ñ€Ð²Ð° Ð¾Ñ‚Ð¿ÑƒÑ‰ÐµÐ½Ð¸Ðµ (Ð½Ð° Ð³Ñ€ÐµÑ…Ð¾Ð²ÐµÑ‚Ðµ). Ð¢Ð°Ð¼ ÑÐµ Ð½Ð°Ð¼ÐµÑ€Ð¸ Ð½ÐµÐ¸Ð·ÐºÐ¾Ð¿Ð°Ð½ ÐºÐ»Ð°Ð´ÐµÐ½ÐµÑ†, Ð¾Ñ‚ ÐºÐ¾Ð¹Ñ‚Ð¾ Ð½ÑÐºÐ¾Ð³Ð° Ð”Ð°Ð²Ð¸Ð´ Ð¿Ð¾Ð¶ÐµÐ»Ð° Ð´Ð° Ð¿Ð¸Ðµ. Ð¢Ð°Ð¼ Ð”ÐµÐ²Ð¸Ñ†Ð°Ñ‚Ð° ÐºÐ°Ñ‚Ð¾ Ñ€Ð¾Ð´Ð¸ Ð´ÐµÑ‚ÐµÐ½Ñ†Ðµ, ÑƒÑ‚Ð¾Ð»Ð¸ Ð¶Ð°Ð¶Ð´Ð°Ñ‚Ð° Ð½Ð° ÐÐ´Ð°Ð¼ Ð¸ Ð”Ð°Ð²Ð¸Ð´. ÐÐµÐºÐ° ÑÐµÐ³Ð° ÐºÑŠÐ¼ Ð¿ÐµÑ‰ÐµÑ€Ð°Ñ‚Ð° Ð´Ð° Ð¸Ð´ÐµÐ¼, Ñ‚Ð°Ð¼ ÐºÑŠÐ´ÐµÑ‚Ð¾ ÑÐµ Ñ€Ð¾Ð´Ð¸ ÐœÐ»Ð°Ð´ÐµÐ½ÐµÑ† – ÐŸÑ€ÐµÐ´Ð²ÐµÑ‡Ð½Ð¸Ñ Ð‘Ð¾Ð³. In Bulgaria, many old people call Christmas / Rojdestvo – Koleda. It was quite interesting to learn in Belarus, the word for Christmas is also Koleda. In Bulgaria and as well as I heard from my Belarusian girlfriend (Svetlana), there is the Christmas tradition of Koledari. Koledari are a group of people going from home to home (primary in Villages) knocking on people's doors and singing Christmas blessings songs wishing the family God bless the house and enrich the possession of the house. I still remember, when young we used to be going from house to house wearing some to "Koleduvame". it is a very pious tradition, which unfortunately due to the globalization and people's migration to live in cities is in a serious decay in Bulgaria. However in many mostly middle and large sized villages, the tradition lives on. The Koledari, songs are a mixture of songs containing Christ's birth news lyrics and traditional song themes. They contain plenty of funny words especially if one understands Bulgarian. The Romanian Christ's Birth Troparion has deeply touched me, I listened it multiple times and I believe is one of the most beautiful songs, one can hear in a lifetime as short as it is. It may something to do with the fact, my grandfather-grandfathers used to be living near the Bulgarian border de-facto in territory of nowadays Romania. Of course as Greece used to be a cradle of Orthodoxy, the deepness and spirituality the song as sung in the language of ancient Byzantine (ex-Eastern Roman) is felt. Intel and IBM future tech world vision about the world, do we really want this? I'm quite a visionary person as such I'm always interested to prognosis on what the world might look like few years from now. 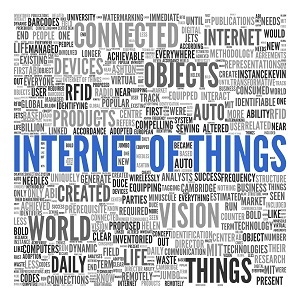 Below are two videos showing IBM and Intel's vision on what might future bring us. I don't know about you but I'm strong in my conviction that I DON'T WANT TO LIVE IN SUCH WORLD. I'm pretty sure that many other people share my opinion that such a world is not fun and is far from what really we're supposed to live. The sad thing is the corporations are already powerful enough to impose their vision and make the vision reality. The logical conclusion might dirive therefore is there is a higher force who leads IBM (and possible most if not all of corporations) on creating the fake tech-nocrat culture society which is building right in front our eyes. The destruction of real communities and the worsening conditions within the Orthodox Church are another symptom that the End Times as prophecised centuries before are closer than we think. I'm sure even people who does not have a believe in Jesus Christ and are not Christian from other religions are also seeing that the direction this world has taken up is dark. We should be very dumb and blind not to see that technology is boxing us and leading us to a modern day techno slavery ….. It is the first week after Orthodox Christian Easter. This year 2012, the Orthodox Christians Easter date was on fifteen of April. We've not just had a feast of an Eastern, but we actually celebrated the greatest day in all human history that happened 2012 years ago – The Glories Resurrection of our Lord Jesus Christ from the Death in the Third day! Some Roman Catholic Christians, might be wondering, why the Orthodox Church is celebrating one week after Jewish Pascha, so in short I will explain in the reason.We orthodox christians do not celebrate with Roman Catholics Easter because Roman Catholics use the gregorian calendar to calculate and decided the day in which the Eastern celebrations should occur, where we the Orthodox Christians use still the old moon calendar (which the jews used too), when Jesus was crucified. The gregorian calendar is very precise from a scientific point of view, however from a Church stand point it is completely wrong because, plainly taking the gregorian calendar math model doesn't take in consideration, that the jews are still celebrating their pascha following the old moon calendar. The consequence is this year Roman Catholics, celebrated with Jewish. This from our Orthodox Christian point of view is incorrect, because Christ's Cross suffering is the pascha for us christians. We Christians consider that the old God ordained jewish pascha was a prophecy feast, simply to remind jewish people before Christ's coming that Messiah (Christ) will come to say his people. As Jewish rejected their true Messiah and Crucified him on the Cross, they have rejected to accept Christ as being the true pascha lamb slained for our sins. Hence the Orthodox Christian Church teaches even to this day, that it is not righteous to celebrate Christ's Glorious Resurrection with Jewish Pascha. Prohibition to celebrate Easter and Jewish Pascha on the same day is an Orthodox Church rule, since the early church days. The Holy Fathers in their Church councils Council of Nicaea etc. has established as unchangable Church rule that, Jesus's Resurrection day feath, should never-ever coincide with the Jewish Pascha Celebrations. The reasons the Church fathers ordered the Church Easter day to be always 1 week after Jewish Pascha is our saviour Jesus Christ ate pascha with his desciples as we can read in the 4 gospels in Holy Bible. After Jesus ate pascha, he was caught mocked, tortured and crucified (killed on a cross shaped trees). Jesus is Risen! Truly He is Risen! Христос Воскресе ! Воистину Воскресе! According to our Church Tradition, Christians should great each other with the Paschal greeting Hristos Voskrese during the whole "bright week" instead of the usual Hi / Hello phrase. Pitily, the number of Roman Catholics who heard or know about this amazing miracle are mostly within the clergy. Its very rare a layman Christian in Roman Catholic realm heard of the miracle. Once again as a closure I want to great everyone with the joyful paschal greeting in the manners of Russians which say it three times during the paschal period. Христос Воскресе! Воистину Воскресе ! also Pudens and Linus and Claudia and all the brethren. Other curious fact maybe, even uknown to Linus Torvalds himself is Saint Linus used to be the first bishop of Rome, after the Apostles bishopship. 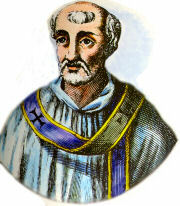 This makes Saint Linus the second in place Roman Catholic Pope after Saint Peter in early Western Church. There are some early sources which says Pope Clement I was the second pope of Rome, however probably this sources are erroneous, since some very important early written sources like the Apostolic Constitutions states Linus was the first bishop of Rome and was ordained by St. Paul. 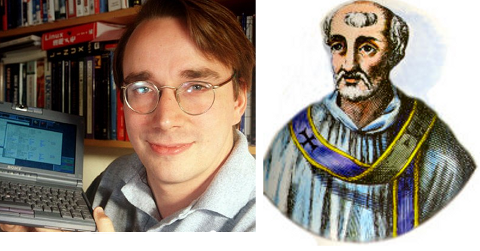 The same documents says Pope Linus was succeeded by Pope Clement – ordained by saint Peter. Something Pope Linus is known with is, to have issued a church decree that woman should cover their heads in church.This ancient church tradition is still observed more or less in the Orthodox Church. It is not known much about how Saint Pope ruled the early Western Church but since the western and eastern Church used to be in communion in these early days, this means the nowdays Roman Catholic saint Linus is probably a saint in the Eastern Orthodox Church as well. According to some unprovable written sources Pope Linus later suffered martyrdom and was buried in Vatican Hill next to saint apostle Peter. St. Linus according to Church tradition passed away in the 1st securury A.D. The creator of GNU/Linux kernel Linus Torvalds might not be a saint in Christian sense, but his deed is definitely saintly as he initiated the creation of the Linux kernel and decided to share its source and publish it under GPL (General Public License). The phenomenon of GNU / Linux Free Operating System existent today and specific type of development is definitely a miracle. 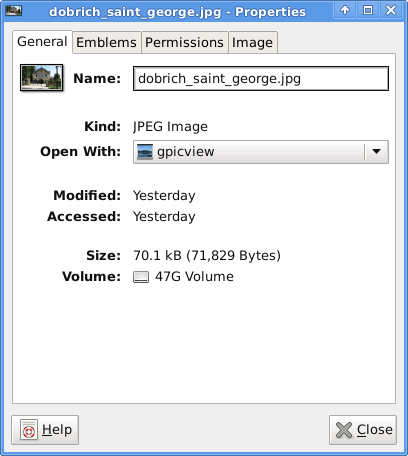 The general philosophy of sharing with neighbor your software is also very close to the Christian philosophy of sharing. Actually too many of the ideas of the free software and "open source" movements resemble purely Christian ideas.